Difference between revisions of "Clarence S. Darrow"
Clarence Seward Darrow was born on April 18, 1857, near Kinsman, Ohio. He attended local schools and eventually enrolled at the University of Michigan. He left this institution without graduating, deciding to study for the bar exam rather than trying to earn a college degree. Purportedly it took Darrow seven times to pass the bar exam, finally succeeding in 1878. Darrow spent the next nine years practicing law in Ohio. In 1887, he moved to Chicago, Illinois, where he served as a city attorney for a time. Darrow also had a private practice, where he defended business owners. In 1894, the attorney stopped defending businesses, choosing to represent laborers because he sympathized with their plight at the hands of the employers. This same year, Darrow successfully defended Eugene V. Debs, president of the American Railway Union, for occurrences during the Pullman Strike. As a result of this case, Darrow became a national celebrity and followed this success with numerous others, including successfully defending Bill Haywood, head of the Industrial Workers of the World, for murdering the governor of Idaho. Darrow's career suffered in 1911, when he represented two brothers who had bombed the Los Angeles Times building. The brothers were strong union supporters. The attorney convinced the men to plead guilty, and Darrow was also accused of bribing a juror. Shortly after this case, Darrow stopped representing labor unions, concentrating his practice on criminal law, especially death-penalty cases. One of Darrow's most famous death-penalty cases involved Nathan Leopold and Richard Loeb. These two men, sons of wealthy parents in Chicago, murdered Bobby Franks, a fourteen-year-old boy. Darrow had the two men plead guilty and, in a brilliant closing argument, convinced the judge to spare both men's lives. They were sentenced to life in prison. Darrow only lost one criminal case out of more than one hundred that he argued in Chicago. In death-penalty cases, Darrow never had a client sentenced to death. Perhaps Darrow's best known case was the Scopes Monkey Trial. In 1925, the Tennessee government enacted a law that made it illegal "for any teacher in any of the universities, normal and all other public schools of the state to teach any theory that denies the story of the divine creation of man as taught in the Bible and to teach instead that man has descended from a lower order of animals." That same year, a biology teacher in the small town of Dayton, Tennessee, disobeyed the law. He taught the theory of evolution, which states that human beings evolved from lesser life forms. To defend Scopes, the American Civil Liberties Union hired Darrow. The World Christian Fundamentalist Association hired William Jennings Bryan to assist the prosecutor in the case. Bryan was a former secretary of state and a presidential candidate. Many people acknowledged Bryan to be one of the foremost experts on the Bible in the United States. During the trial, Darrow, in a surprise move, called Bryan to testify. Darrow hoped to disprove the Bible and used Bryan, a supposed expert on the religious text, to do so. During the questioning, it became obvious to people in attendance that Bryan could not explain much of the Bible, including how God could have created Eve from Adam's rib. Once Darrow rested, the jury quickly found Scopes guilty, because he had clearly violated the Tennessee law against the teaching of evolution. Scopes lost his job and was forced to pay a one hundred dollar fine. The Tennessee Supreme Court eventually overturned the verdict on a technicality. Darrow, however, appeared to have won the larger battle, that people could not take the Bible literally. Newspapers across the country declared that Darrow had proven religious fundamentalism to be wrong. Adding further to this belief was Bryan's death just five days after the trial. Not only was religious fundamentalism dead, but now, so too was its greatest defender. Following the Scopes Trial, Darrow, for the most part, retired from the legal profession, accepting only a few cases. 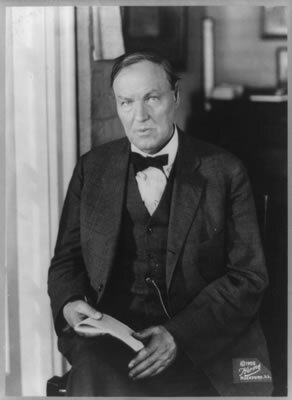 Darrow died on March 13, 1938. He was one of the most famous and successful attorneys of his era.